© 2016 TE Connectivity Ltd. family of companies. TE Connectivity, TE connectivity (logo), and TE (logo) are trademarks. Other logos, product, and/or company names may be trademarks of their respective owners. This controlled document is subject to change. visit our website at www.te.com. Reasons for reissue of this instruction sheet are provided in Section 7, REVISION SUMMARY. the ram of the tool, in all applications. 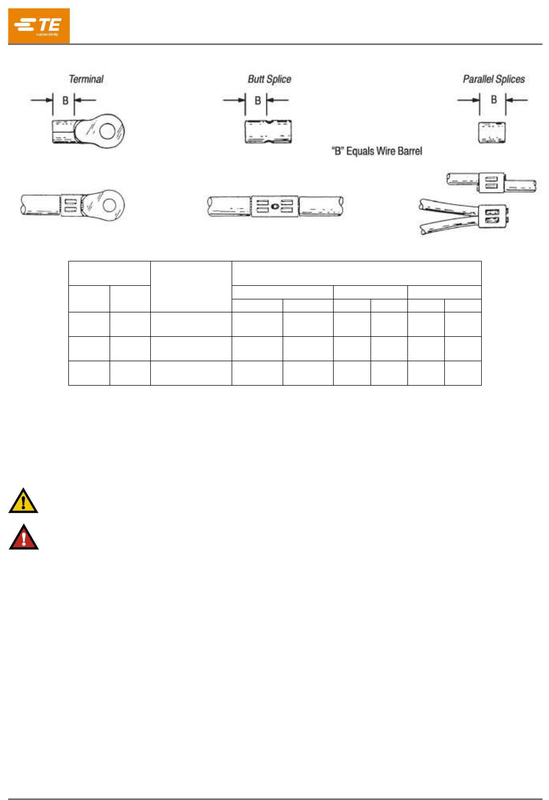 Refer to Table 1 and determine the correct die assembly and wire size for the terminal splice part number. Avoid personal injury. Exercise extreme caution when using the tool. 1. Pivot the latch arm away from the yoke to open the crimp head. 2. 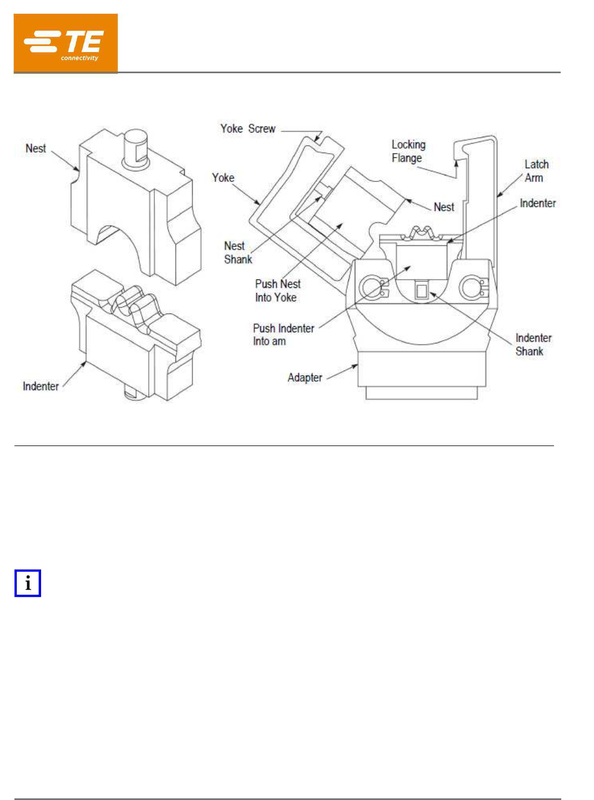 Loosen the set screw in the yoke. 3. Insert the shank of the nest into the yoke and tighten the set screw. 4. Extend the ram until the set screw is visible. 5. Loosen the set screw in the ram. 6. Insert the shank of the indenter into the ram and tighten the set screw. 7. Return the ram to the down position. Always make sure the yoke and latching arm are secured by the locking flange before cycling the tool. 1. Pivot the latch arm away from the yoke to open the head. 2. Loosen the set screw in the yoke and remove the nest. 3. Raise the ram to full up position. 4. Loosen the set screw in the ram and remove the indenter. 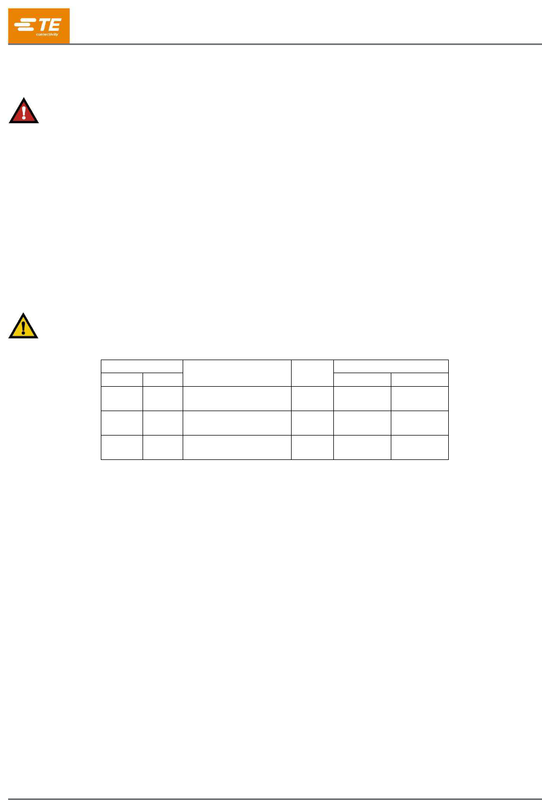 Strip the wire to the dimensions listed in Figure 2. DO NOT nick or cut the wire strands. splices or wire near the crimping area. with the wire size or range stamped on the nest and indenter. 2. Pivot the latch arm away from the yoke to open the head.